Adventure pain 'tackles modern life' Jump to media player Extreme adventure challenges can help office workers deal with the "anxieties of modern life", new research suggests. 'Some of the best adventures can be had in Wales' Jump to media player Former Wales rugby union star Richard Parks on his latest extreme adventures - at home in Wales. 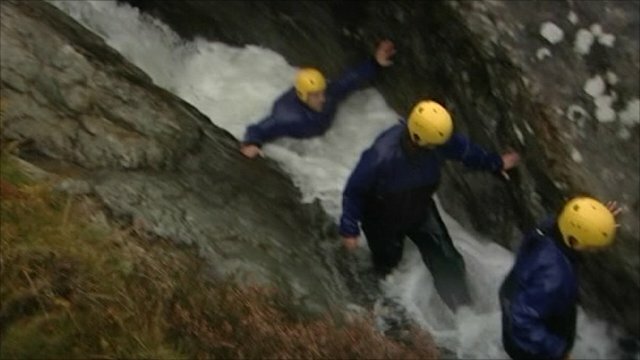 Riding waterfalls in search of adventure Jump to media player Ghyll scrambling, which involves descending from heights by riding waterfalls, has become a popular extreme adventure in the Lake District. Extreme adventure challenges can help office workers deal with the "anxieties of modern life", new research suggests. Cardiff University academics looked into the reasons why people take part in the Tough Mudder event.